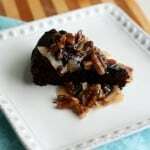 Home » Dairy Free » Gluten Free German Chocolate Cake (Dairy Free, Vegan). 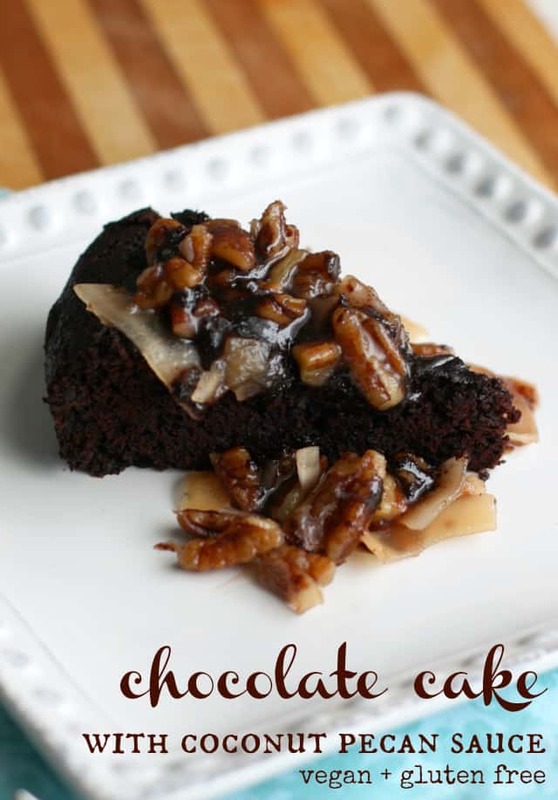 Gluten free German chocolate cake is perfect for a special occasion! The decadent coconut sauce is absolutely delectable! I mentioned last week that I was going to attempt to adapt my favorite birthday cake to fit in with our family’s food sensitivities. A gluten free German chocolate cake would be challenge enough, but to make it vegan, too? I realized that by typing that out and putting it on the internet I was probably jinxing myself! I did have one batch of frosting that just did not work out, as I mentioned on Facebook. Making an egg-free version of a cake that has so many eggs was not an easy task. Once I started to think about the frosting as more of a coconut and pecan sauce, though, it all worked out and this gluten free German chocolate cake was delicious. Gluten Free German Chocolate Cake. 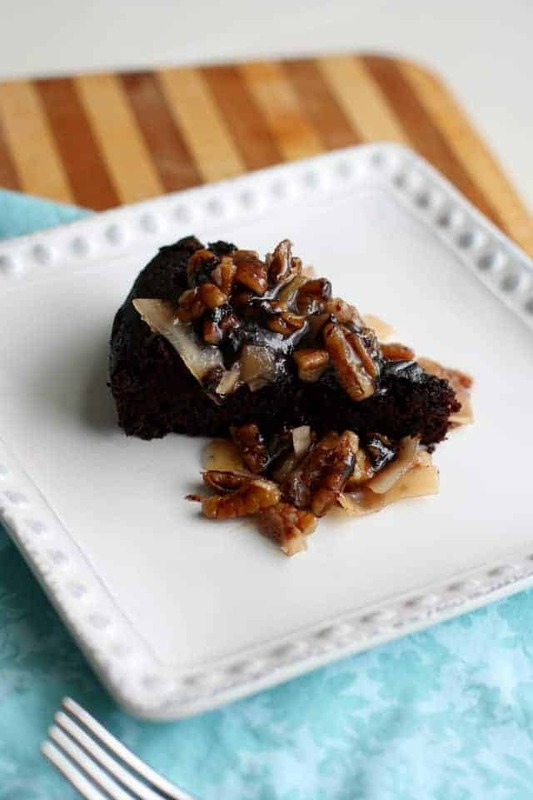 A vegan and gluten free version of German Chocolate cake with coconut pecan sauce. Preheat the oven to 350 degrees. Grease and flour a 9 inch cake pan. Sift flour, baking soda, baking, powder, salt, and cocoa powder together in a large bowl. Add the sugar, oil, water, non-dairy milk, and vinegar, and beat on medium speed until smooth. Pour batter into cake pan and bake at 350 degrees for about 30-35 minutes, or until a toothpick inserted in the middle of the cake comes out clean. Cool in pan for 45 minutes, then loosen the edges with a knife and invert onto a cake plate. Don’t remove from the pan too soon, because it might fall apart – gluten free flour is a little bit more delicate. To make the frosting: Melt the buttery spread in a heavy bottomed saucepan over medium heat. Add the sugar, and stir frequently. It will melt and start to thicken a bit. Combine the arrowroot powder and non-dairy milk in a small container with a lid. Shake well and drizzle the mixture into the pan a little bit at a time, stirring constantly. The sauce should start to thicken. Stir in the coconut and pecans, and heat through. If the sauce seems too sugary and thick, you may have to add a little bit more non-dairy milk. As it cools, it will thicken up. Slice the cake and spoon sauce on top. Store leftover sauce in the refrigerator. It will solidify, so to serve the next day, you will have to reheat it, either in a pan or in the microwave. Is this only one cake? One 8 or 9 inch cake. If you need a double layer cake, you will need to double the recipe. I used this recipe last weekend for my boyfriend’s birthday and it was delicious! He has PKU, which means we have to avoid proteins when we cook, since his body can’t digest Phenylalanine. We typically have to use dairy substitues, and GF flours, as they are lower in protein. 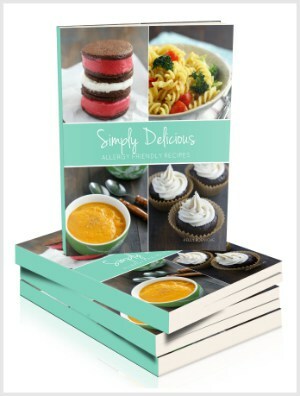 The PKU websites have kind of ‘boring’ recipes, but I loved finding all sorts of great recipes on here that were Gluten and Dairy free. I did have to not put nuts in the ‘frosting’ (legumes, nuts, etc are also off limits to him), but It was still yummy! Yay! I’m so glad that you liked it! Happy belated birthday to him! Made this for my Mom for her b-day. Wow, so terrific and yummy! Do you think the cake could be made in mini muffin tins too? So glad you liked it! I think they could be made as mini muffins, I just would really watch them, the bake time would be much less. 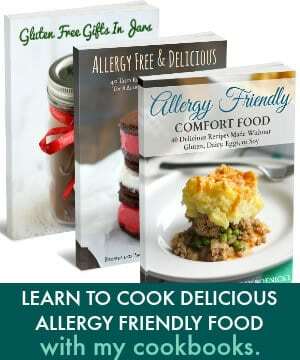 My famIly has a tonne of food allergies and it’s so hard to find something that suits everyone. Well done on re-creating your favourite cake. It looks great! I’m trying it tomorrow as my son is now not eating dairy (including eggs), can’t wait to try it! 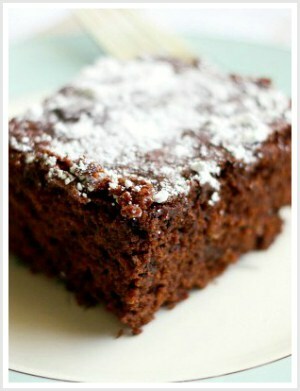 You made my day:gluten, dairy, soy, corn free scrumptious cake! Made it for my dad’s 89th birthday! The whole family loved it!!!! Oh, I am so glad to hear that you enjoyed it! Wonderful news! And for such a special occasion! 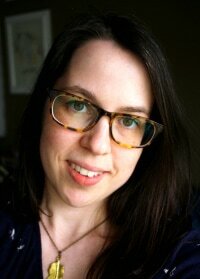 Thanks, Sarah! It was really rich, perfect for a special occasion! I’m SOOO glad you shared this! I have been searching everywhere for a gluten free German Chocolate cake recipe for my SIL. Thanks so much! Oh good, I am so glad that you found this recipe, then! I hope she enjoys it! Thanks, Natalie! It was a nice day, and we were able to have dinner out, just the two of us, which was nice!